The sacred bond of brothers and sisters in India is cheered well with the most mesmerizing celebration Raksha Bandhan. The day is sacred for siblings as on this day they enjoy the mirth and merriment of their relationship. Siblings bond is considered as a pious bond one is blessed with. The festival which is observed on full moon day in the holy month of Shravana has many beautiful customs and rituals. Coming to the main elements of the festival, then Rakhi is the sacred thread which is an inevitable part of the celebration. It is a bejeweled thread with lot of positivity, which is tied around brother’s wrist by sister as a protection band. 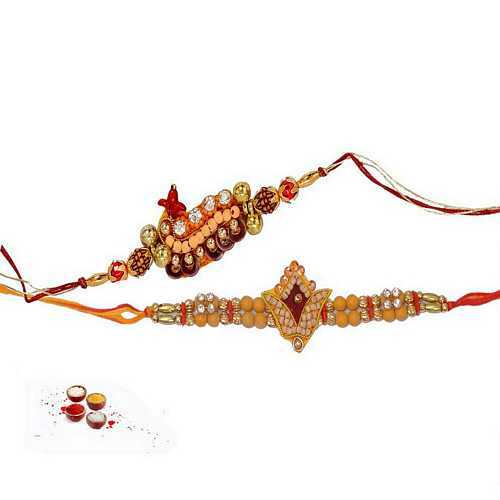 Depending on the need and deed of the people there is a plethora of rakhi design and patterns. As rakhi is a sacred thread hence auspicious rakhi is one amongst the best pick for the day. Most of the sisters prefer to go with auspicious rakhi thread which is meant to spread a lot of positivity in brother’s life. 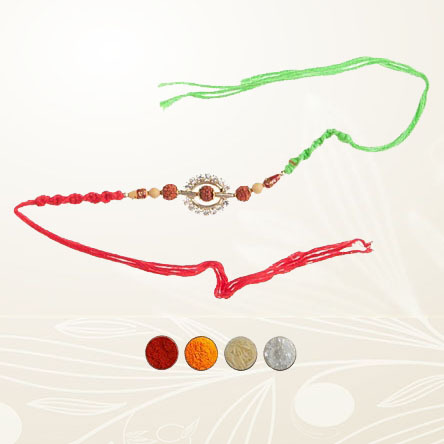 Rudraksha rakhi is one of its kinds amongst auspicious rakhis. Rudraksha is a holy bead which is believed to be a part of lord Shiva. With this it is also believed that Rudraksha bead eliminates all the negative energies from the environment. Rudraksha beads is said to carry health, wealth and prosperity. As it is believed in Hindu mythology that wearing rudraksha will provide a peace of mind, hence this sacred bead is worn by the male who are a firm believer of lord Shiva. Those sisters, who are aware with this always, prefer to go with Rudraksha rakhi for their brother. Rudraksha rakhi is though an auspicious rakhi but with a touch of modern design and concept it is one amongst the best season pick. The various patterns available in rudraksha rakhi are single rudraksha rakhi, double beads rudraksha rakhi, bracelet rudraksha rakhi, silver rudraksha rakhi and rudraksha and diamond rakhi. We have a complete range of rudraksha rakhi and gift hampers. 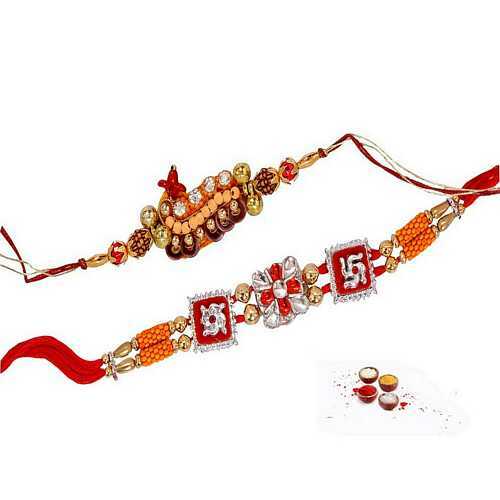 Sisters who are willing for a complete rakhi surprise along with rudraksha rakhi can find much more here. 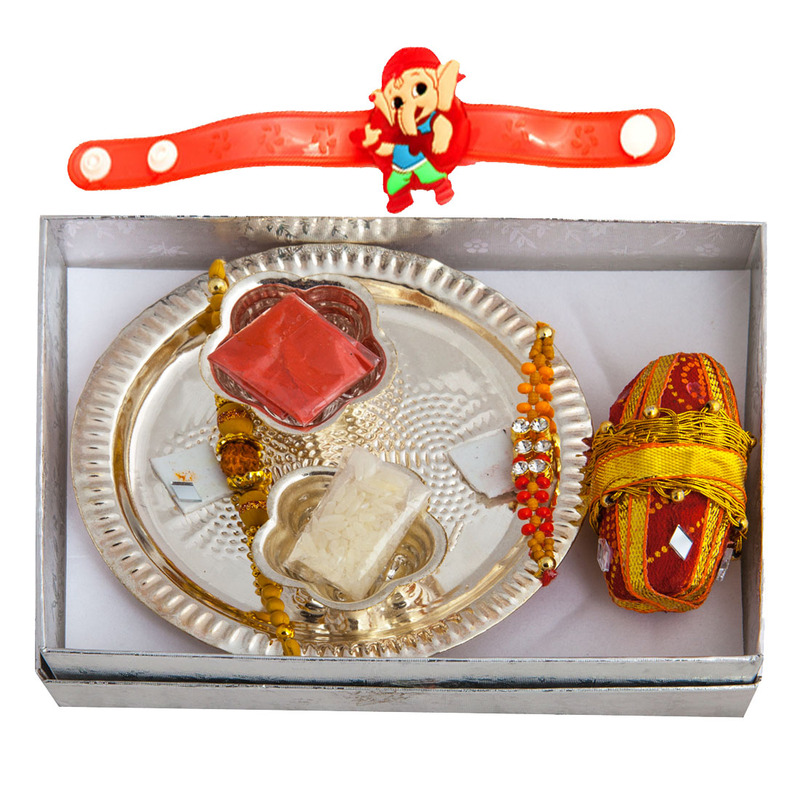 The pretty rakhi hampers that are available with us with rudraksha rakhi are rudraksha rakhi with sweets, rudraksha rakhi with dryfruits, rudraksha rakhi with chocolate hamper, rudraksha rakhi with pooja thali, rudraksha rakhi with divine and spiritual gifts, rudraksha rakhi with idols of ganesha, rudraksha rakhi with flowers, rudraksha rakhi with cake and rudraksha rakhi with personalized gifts for brother. Send Rudraksha Rakhi Online to India to all the big towns as well as small cities of the country such as Bangalore, Chennai, Jaipur, Jodhpur, Udaipur, Varanasi, Kanpur, Allahabad, Lucknow, Patna, Ranchi, Raipur, Chandigarh, Dehradun, Mumbai, Delhi, Pune, Hyderabad, Kota, Ahmedabad, Sikandrabad etc. Rudraksha is one of the precious beads that carry a lot of religious sentiments too. It is said to be very close to lord Shiva and is considered to bring health, wealth and self empowerment. Mainly this seed is worn by males and is believed to carry good luck too. 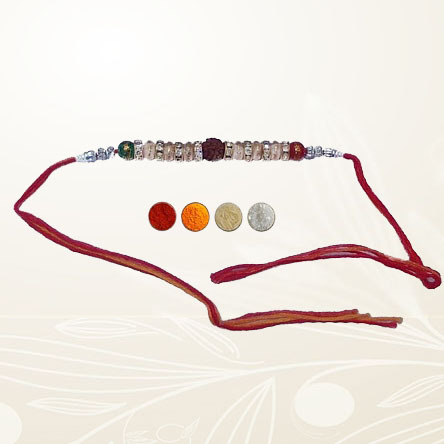 A rudraksha in the beautiful golden thread of rakhi generates sense of spirituality. It is something, which really binds us with our religion and its beliefs. 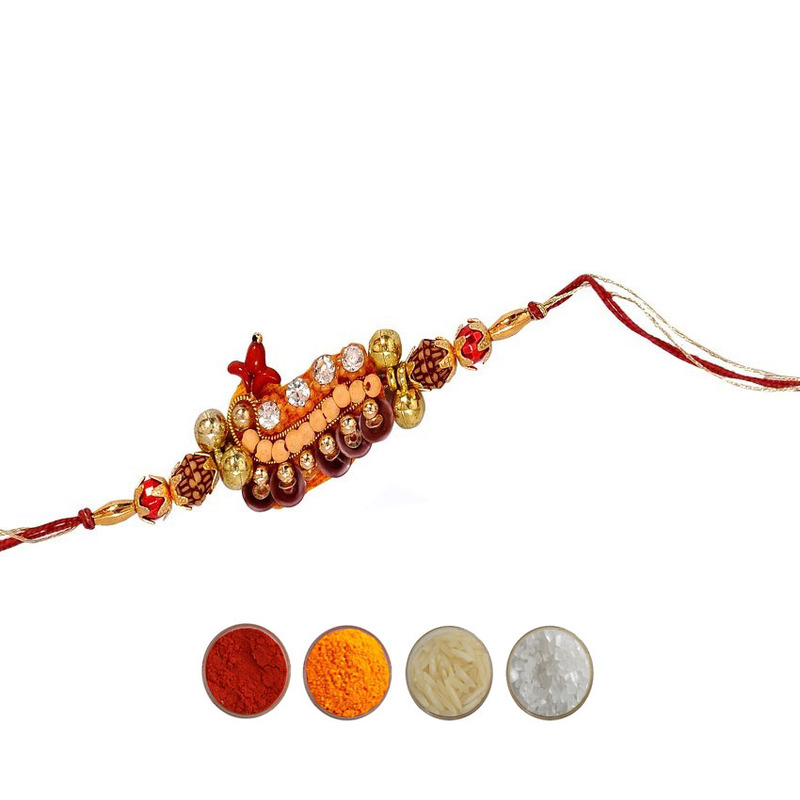 Rudraksha rakhi is one of the auspicious rakhi you can buy for your brother. You can buy rudraksha rakhi online or send rudraksha rakhi to India to spread spirituality on the very special occasion of love.